It is easy to look out your window and feel a sense of relief from the drought conditions that have been plaguing our community. Above-average rainfall has brought Santa Barbara lush green hillsides and water flowing in creek beds that have been sitting relatively dry for years. The most recent U.S. Drought Monitor shows that much of California, including Santa Barbara County, is no longer experiencing drought conditions. While the immediate climate conditions have improved, water conservation remains important. Gibraltar Reservoir: The City’s reservoir filled and spilled on January 17 and is currently full. Diversions from the reservoir have been limited due to water quality concerns as a result of the Thomas Fire. Groundwater: The City relies on groundwater more heavily during droughts when surface water supplies are limited. The City’s groundwater basins reached historically low levels in 2016. The City has been “resting” the groundwater basins to let them recover; however, it could take 5-10 years before the basins are completely replenished. 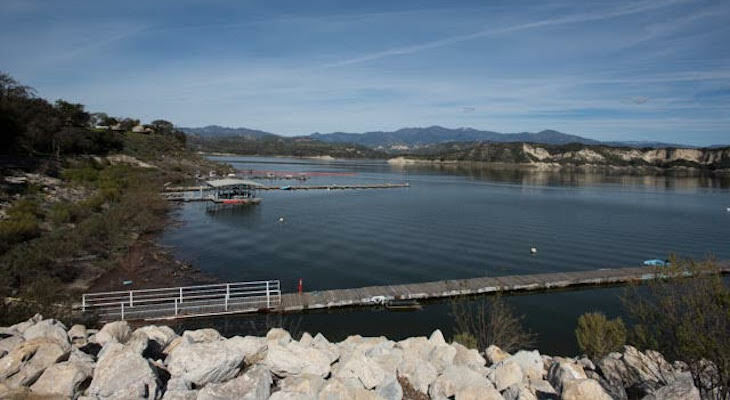 Lake Cachuma: The reservoir is currently 75% full, but it is a shared resource with water stored belonging to other agencies, including downstream water rights. The annual water supply allocation from Cachuma is currently low, at 20% of normal maximum amount. While an increase in allocation from the U.S. Bureau of Reclamation is soon anticipated, no increase has occurred to date. State Water: The 2019 allocation from the State remains low at 35% of the maximum amount. This is likely to increase due to significant rainfall and snowpack received across the state this winter. However, the allocation has not yet increased. Desalination: The City’s desalination plant has been operating since the summer of 2017, providing nearly one-third of the City’s current water demands. It is important to understand that while winter rainfall has improved our water situation, some of our water sources will take several years to fully recover. Your conservation efforts will help our groundwater basins to recharge and preserve surface water storage for use in future dry years. City staff are continuing to assess the supply situation, and it is anticipated that changes to the City’s current water shortage declaration will occur in April 2019, once more information is known regarding Cachuma and State Water allocations. In the meantime, the City continues to rely on the community’s excellent ongoing efforts to conserve water and protect our limited water supplies. One added benefit of the rain? Give your sprinklers the winter off. Consistent rainfall will help your garden thrive and lower your water bill when you turn off your watering system. For more information on water supplies, drought, and water efficiency, visit www.SantaBarbaraCA.gov/Water. Please don't shut down the desal! It seems to be the magic element that brings the rain. I plan to keep up with my rainwater collection. This year we got to 360 gallons and it will last for use in our raised beds for at least a couple of months. It fills with only 0.10" of rain. Almost no effort and minimal expense, and it is more attractive than a Prius. We did have a great rain season but no guarantee next year, and ones to follow, will be a repeat. 9 units will save 300% over a single family home? Sounds like wonky math. use less. pay more. keep the salaries of those employed the same and increase yearly. next. Our conservation efforts? What about YOUR conservation efforts, City of SB? Look at all the development going up around town! Just down the street from us, what used to be a single family home is now going to be a 9 unit apartment building! More people using more water! Lead by example then maybe we will follow. Prove it - low-flow water devices make up for increased population numbers - city will speculate without facts about anything, just to drive more growth which they hope will generate more city tax revenues. They have tapped out the current population, so they need unending new crops of voters and spenders, in order to keep their own city salaries flush. Meanwhile demanding we long suffering city residents do not to flush. This Ponzi scheme must end. Voters do the right thing. Agree. The water that used to go on my lawn now goes down someone't toilet in one of those hideous high density developments. Ultimately, is the problem too little rain or too many people living in a semi-desert environment? But those 9 units will have water saving faucets, actually saving the city 300% over that old single family home, silly!